We suppose it was only a matter of time before we made a giant leap in the terms of artificial-intelligence (AI). Last year, the net was abuzz over the Japanese company named Vinclu announced their interactive AI home automation system. That system is called Gatebox. This is a new dip into the Internet-of-Things product that aims to take on Amazon’s Echo with its Alexa persona. It showcases a holographic anime character of Vocaloid proportions. Gatebox is priced at around 321,840 Yen or roughly around $2,700. The company is currently entertaining pre-orders primarily from Japan and the US. The technological wonder is aimed at the single company worker and the most avid anime enthusiasts. Gatebox promises the experience of “living with your favorite character”. It’s roughly the size of your average coffee-maker and compact with a base that’s no larger than a sheet of A4 paper. The main feature is a clear projection tube that displays the computer-animated avatar for the AI’s character. On the outside of the cylinder are microphones, cameras, and sensors to detect temperature and motion. This enables the AI to interact with its owner on a more personal level rather than being just a voice on a phone like Siri. As of now, there’s only one character available, the blue haired Azuma Hikari. Although at present, Vinclu is currently developing other characters to choose from. Hikari’s designer, Taro Minoboshi, is pretty well-known for working on Konami’s Love Plus dating simulation game series. Gatebox will interact with its owner through its animated persona—responding to voice interactions. A big feature is its ability to send and receive text messages when its owner or “master” is not home—acting primarily like a domestic partner. Gatebox is also designed to control smart home appliances like your preprogrammed lights and robotic vacuums. This gives the illusion that your “waifu” has the lights on for you and has already done cleaning up your home. In the Japanese language, the word ‘hikari’ means, light—so it’s pretty fitting that one of her selling features is being able to switch on your lights for you. The sensors in the Gatebox will mean that the character will be able to recognize your face and your voice. 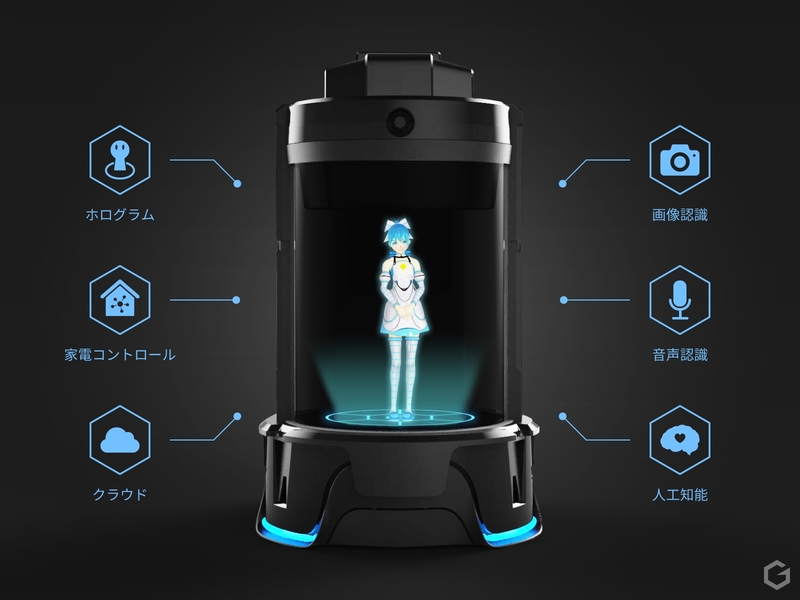 Beyond being linked to your smart appliances, the character is also designed to be able to wake its owner up in the mornings, list out the to-do activities, to remind the owner of certain important events. The Gatebox comes with a Bluetooth and permanent connection to the internet and it can be liked up to a TV using an HDMI cable. The Gatebox website proclaims that the first character, Azuma Hikari, is designed to have a “comforting female persona that is great to those living alone”. Azuma Hikari is voiced by Japanese actress Yuka Hiyamizu. The Gatebox character even has a backstory of sorts. A Japanese comic or manga explains that Azuma Hikari was invited to cross dimensions for a “homestay” with a master on Earth. Presently, Hikari only converses in Japanese but is still learning and her language skills are growing. Vinclu promises that, in time, she will be able to hold verbal conversations—for now, she may only communicate through messages in the controlling app. The app is set to be compatible with both Android and iOS. Things are certainly heating up in the development of AI and interactive features. As it’s only the start of the year, people are eagerly looking out for any new developments to beat what the Gatebox “waifu” promises.